This came truer than expected. We're five days away from the Greatest Royal Rumble, a house show which has quickly transformed into a second WrestleMania of sorts. If the chatter is to be believed, it's the latest attempt at a Roman Reigns coronation. It comes after four years of trying, and the saga of Roman Reigns as a main eventer has been one of continuous failure. Even if this is truly "it," the outcome matters little. Roman Reigns is a talented performer and sells a lot of merchandise, but frankly, he's never going to get over as the company's leading babyface. He'll never be able to properly assume the position once held by Bruno Sammartino, Hulk Hogan, Stone Cold Steve Austin, The Rock, and John Cena. And while Cena himself had problems, Roman Reigns is hated far more than his "predecessor" ever was. Four years of horrendous booking are more to blame for this situation than Roman Reigns himself, and yet, Vince McMahon still hasn't learned and refuses to change his approach, even after 9 times he screwed his own golden goose. The Shield was obviously formed as a vehicle to get Roman Reigns over. From 2012-14, it was doing its job. Roman Reigns was very popular as part of the group, as were Seth Rollins and Dean Ambrose, who have retained their popularity. Many fans regard the breakup as having happened too soon, and immediately afterward, Roman Reigns was rocketed to main event status. A 2014 injury put him on the shelf for a few months, but he nonetheless won the Slammy for Superstar of the Year. That's also when some signs of trouble brewed. His popularity began to wane as 2014 came to a close and he delivered his first infamous botched promo when he declared he would enter the 2015 Royal Rumble. He would go on to deliver his laughing stock Jack and the Beanstalk promo in January 2015. It was already clear that Roman Reigns was the desired second coming of John Cena, but was nowhere near as charismatic. His immediate push into main event status also exposed that he wasn't quite yet ready for the spotlight, which would become clearer and clearer as time went on. 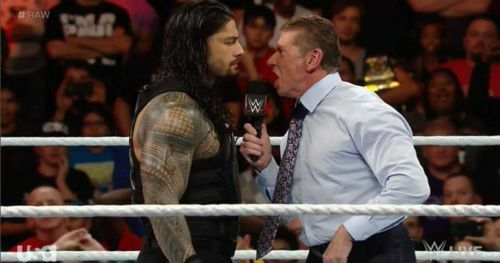 Vince McMahon's impatience set the stage poorly for things to come.